Yesterday, professors at the University of Wisconsin-Madison made local and national news with a survey claiming that nearly 17,000 potential Wisconsin voters had been “deterred” by the state’s voter ID law. The survey was mailed to 2,400 persons in Dane and Milwaukee County who were registered but did not vote, asking why the respondents did not vote. Very few of the persons who received the survey responded and, of those, about 30 said it was because they thought they lacked a proper form of ID. This was extrapolated into the larger number. All of the usual suspects repeated all of the expected talking points with the Clerk of Milwaukee County suggesting that the survey shows that “Jim Crow laws are alive and well.” Someone should have asked some hard questions. The survey proves nothing of the sort. First, the study itself establishes lack of ID was not the problem. In a statement made to the media, one of the study’s authors, UW Professor Kenneth Mayer, said that persons who are eligible but “cannot vote because of” the Voter ID law have been” disenfranchised.” But that it is not what the survey found. 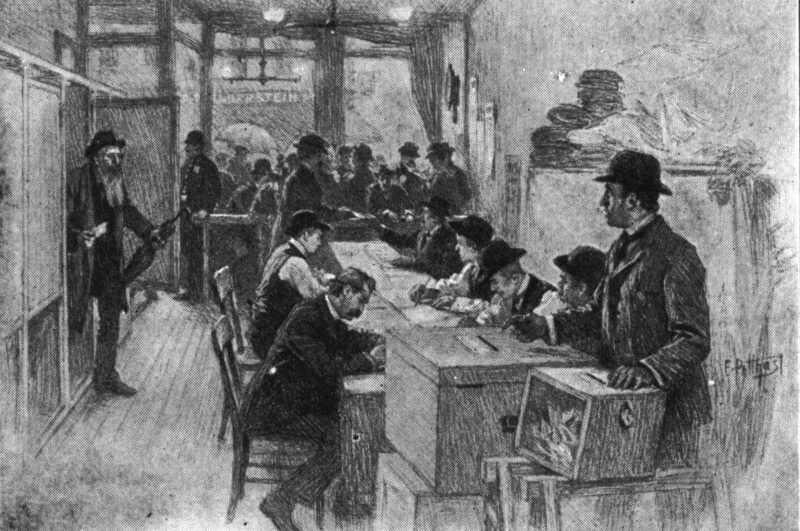 According to the press release from the study, “Most of the people who said they did not vote because they lacked ID actually possessed a qualifying form of ID.” This crucial finding was omitted by the Journal Sentinel who instead led with the following sentence: “A study released Monday estimates 16,800 or more people in Dane and Milwaukee counties were deterred from casting ballots in November because of Wisconsin’s voter ID law.” (emphasis added.) 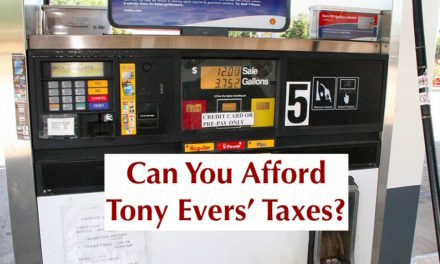 It seems that both Dr. Mayer and the Journal Sentinel may have allowed their rhetoric to exceed the facts. If the survey results are representative (more on that later), then it is possible that the state or the candidates should have done more to educate people about the law. Maybe the laws’ opponents could have toned down their overblown rhetoric claiming that the law disenfranchised massive numbers of voters. But it is fundamentally misleading to say that all of those who claimed they did not vote because of the law could not do so. The most this survey can claim to prove is that the administration of the law could have been improved or that the candidates could have run better ground games. According to the survey, the Voter ID law was not a main reason for those who did not vote. The main reason cited by those who did not vote is that they were for “unhappy with choice of candidates or issues” (33% chose this). After that, other reasons for not voting include being ill, out of town, not interested, otherwise occupied or believing that their vote did not matter. Only 1.7% respondents believed that they did not have an adequate photo ID and 1.4% claimed to have been turned away at the polling place (which might have been related to ID). Put another way, the main reason for not voting cited by somewhere between 95% and 98% of the respondents was unrelated to the Voter ID law. Yet the New York Times headline reads: “Wisconsin Strict ID law Discouraged Voters, Study Finds.” Well, yes, it may have discouraged a few. But Donald Trump and Hillary Clinton seemed to have discouraged many times more. “I was feeling ill” and “I was gone” or “I didn’t care” were far more common reasons given for not voting. 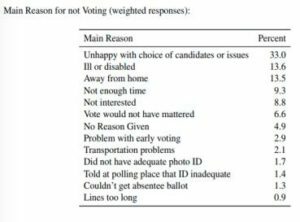 When almost all nonvoters had other reasons not to vote, it is dangerous to assume that even those who cited voter ID as the “main reason” would have voted but for the law. And, of course, as we have seen, most of those who said they didn’t vote because of the law actually could have voted. The survey raises serious doubt over the relationship between voter suppression and voter’s income and race. This press release issued with the survey claims that “the burdens of voter ID fell disproportionately on low-income and minority populations.” The actual results are not so clear. 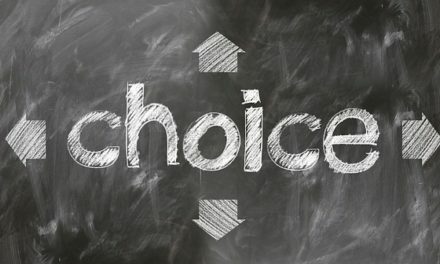 While blacks and low income persons were more likely to cite a lack of voter ID as one of the reasons they did not vote, there was no statistically significant difference between whites and blacks and those with incomes above or below $25,000 with respect to those who actually did not have an acceptable form of ID or who cited the presumed lack of ID as their main reason for not voting. The study has little bearing on the results of the 2016 presidential election. The study simply does not show that. It does not even suggest it. The survey – in what seems to be a political and not research driven choice – was sent to only Dane and Milwaukee County voters. Perhaps nonvoters there would have preferred Clinton. But just as many voters may have been “deterred” (if that is even a fair description of the finding) in counties that were more likely to favor Trump, thus lowering his ostensible vote total in those places. Because of the low response rate, self-selection bias, and social desirability, the survey respondents may not be similar to other non-voters. The researchers mailed a survey to non-voters in two Wisconsin counties: Dane and Milwaukee. They mailed out surveys to 2,400 people, of which 293 were returned—a response rate of 12.2%. Given the level of response, there should be significant concern about the extent to which the respondents represent all non-voters in these counties. The reason for concern is that respondents with a higher level of interest in the topic at hand are more likely to respond to surveys than those with low levels of interest. We see evidence of this when we look at reviews of businesses on Google or Yelp. Reviews tend to be clustered at the high and low ratings. Those that had a mediocre experience tend not to write reviews. In this case, the likely respondents might be those that had difficulty in voting for one reason or another. If this is indeed the case, the estimated share of non-voters who blame voter ID in the survey may be biased. In addition, we know from political science that voting is an area for which the respondent will desire to make themselves look ‘good’ to the pollster. In the context of voting, this means that respondents often report having voted when they actually did not. In the context of a survey of non-voters, this is likely to manifest in the identification of forgivable reasons for not having participated. Stories about the onerousness of Wisconsin’s voter ID laws were pervasive in the aftermath of the election. This may have provided respondents a ready scapegoat to blame for their lack of participation. Given the scant evidence that the survey provides for any effect of the law, even a slight overstatement of its impact would make the claimed level of deterrence vanish. PreviousGamble with your safety? Barrett says YES.